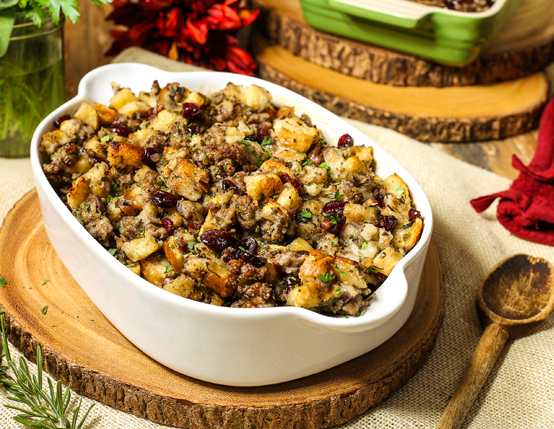 The bright, tangy flavors of dried cranberries and tart apples are the perfect addition to traditional stuffing made with savory Jones breakfast sausage. In large skillet over medium heat, cook sausage using spatula to break it up as it cooks. Add 1 1/2 tablespoons sage. Cook through, but do not brown. Remove sausage from skillet using slotted spoon and add it to bowl with bread cubes. Leave 2 tablespoons of sausage drippings in the pan (drain any extra) and add shallots. Cook until translucent; add pecans, herbs and remaining sage to skillet. Cook 2 minutes stirring frequently. Pour shallot herb mixture into bowl with bread cubes. Add wine to skillet and scrape browned bits from bottom of pan as it cooks. Add butter and chicken stock. Bring to boil for 3 minutes, remove from heat and pour over bread cubes in bowl. Add eggs.Toss gently until combined and pour into prepared baking dishes. Cover with foil and bake 40 minutes. Remove foil and bake 15 minutes more. I love it, many flavors and textures. Goes well with anything. Freeze half and it keeps well. Didn't make it yet, but the recipe seems "right". Next time this comes up for a try. To the poster that said the recipe seemed too strong with sage and rosemary, I already planned to make it without either. First, I'm not a fan of rosemary, and the sausage already has a proper amount of sage to carry the spice palette. I've added a bit of sage to my current recipe of stuffing and found it had to much sage. 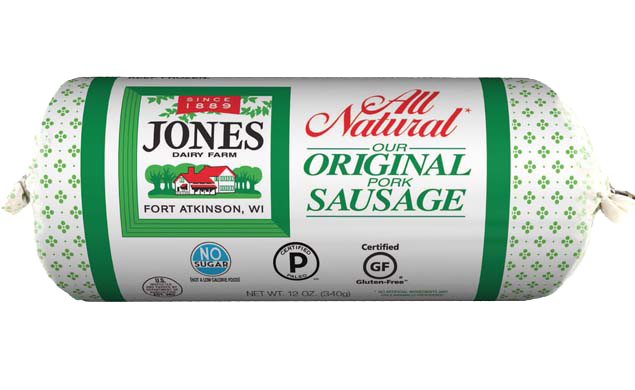 Let the Jones sausage take care of the sage. Looking forward to trying this! This recipe is sure to be a hit! I got so many compliments on it for Thanksgiving. I will definitely make this every year.